Analysis of engine flowpath physics, anchored to available experimental and CFD data, has shown this performance gain to be dependent on the propellant combina tion of choice, the chosen feed system, and other design parameters. It is only through detailed component energy balancing, coupled with unsteady detonation analysis and loss modeling that accurate estimates of the PDE/PDRE performance may be obtained. Three key parameters that determine performance are, nozzle length compared to the detonation tube length, fill fraction (i.e. whether there are multiple detonation waves present in the engine), and detonation frequency. The first factor is nozzle length. Nozzle lengths can double the Isp for a hydrocarbon-fueled PDRE [Kailasanath, 2002]. The data from [Daniau, 2002] indicates that a divergent nozzle does not adversely affect the cycle time. Detonation frequencies in the 140 Hz range for hydrogen-oxygen and 110 Hz for hydrocarbon-oxygen mixtures are possible [Daniau, 2002]. The importance of the information, is that for a fully airframe integrated PDE with the aft-body forming the nozzle, a beta parameter in the 5 to 6 range enhances the PDE performance. Beta is the ratio between nozzle length and combustion chamber length. 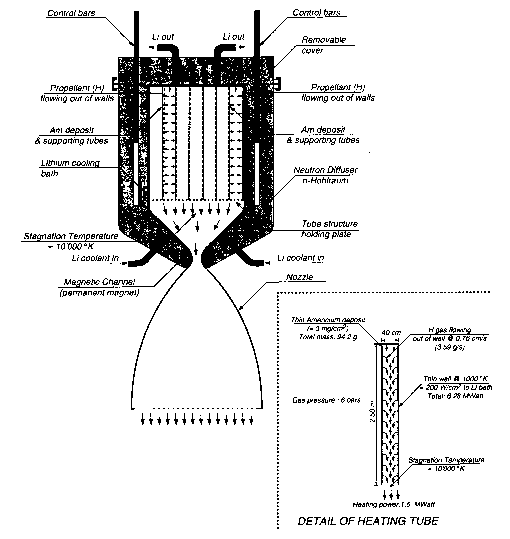 The combustion chamber length is not the entire tube length, the forward part of the tube being where the combustion is initiated, as shown in Figure 4.24 (see the color section). The second factor that affects the performance of the PDE is the fill fraction. In an ideal detonation wave tube, Figure 4.24, the products of combustion exit the tube and the tube is purged before the next charge is introduced. An option is to introduce a new charge into the tube before the cycle is complete. In this case the fill fraction is less than 100%. That is, only a fraction of the tube receives a new charge. A reduction in the fill factor directly affects the Isp of the engine, no matter at what frequency. In this chapter a 100% fill and a 60% fill fraction were used. The partial fill case provides 38% greater Isp than the full fill case. The former is referred to a full fill and the latter is referred to a partial fill in the propulsion characteristics and sizing results. The third factor affecting performance is the detonation frequency. In a chart shown by [Kailasanath, 2002], the real difference in the performance of the PDE versus the ramjet is governed by the detonation frequency of the PDE. The chart depicts experimentally determined thrust versus frequency for the PDE compared to a ramjet. For the PDE, as the frequency is increased the thrust increases almost linearly. For a modest frequency PDE operating at one-half the maximum frequency of 35 Hz, the thrust is 2.25 times the ramjet thrust. Since the reason for rocket-driven ejectors in the ramjet engine is to obtain greater thrust at low-speed, the pulse detonation engine has significant potential to increase low-speed performance over that of a ramjet. For this chapter a thrust of twice the subsonic through-flow ramjet engine was used (Figure 4.25). In the low-speed flight regime, there is insufficient kinetic energy to produce a static compression enthalpy ratio (C) sufficient to sustain ramjet operation. The rocket ejector ramjet is a means of providing sufficient nozzle enthalpy and pressure ratio to have an efficient ramjet at speeds lower than Mach 2.5. The PDRE does not depend on ram pressure: with the PDE ejector it has sufficient pressure ratio to operate at zero flight speed as either a pulse detonation rocket or as an airbreathing pulse detonation engine analogous to the rocket ejector ramjet. So, the question was to predict its potential performance using Builder's analysis. Figure 4.25. 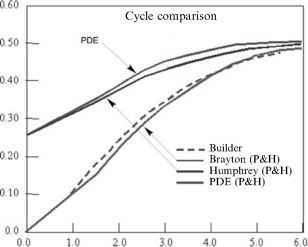 The pulse detonation engine (PDE) cycle compared with the Brayton cycle. P&H indicates the [Heiser and Pratt, 2002] paper. The original Brayton cycle analysis by Builder [Builder, 1964] was based on the static enthalpy rise within the engine. Builder called the term (C) the static enthalpy compression ratio h/h0, where h0 is the freestream static enthalpy. If Cp = constant, then C = T/T0. Extension of Builder's original work by Czysz [Czysz, 1988] continued that nomenclature. [Heiser and Pratt, 2002] and [Wu et al., 2002] use static temperature ratio for the value of C so there is about one unit difference between the two definitions of C in the 5,000 to 6,000 ft/s range, with the temperature ratio definition being the lower value. The comparison in performance is made using the energy conversion efficiency (9), that is, what fraction of the input fuel energy is converted into useful thrust work.